Like all kids, grandsons John and Andrew really enjoy playing with magnets. 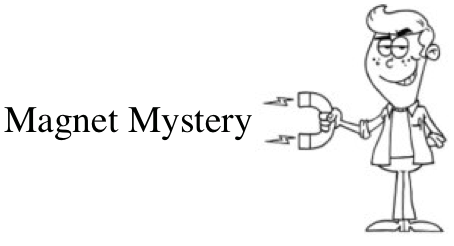 Even very young children realize that a magnet has the mysterious ability to influence most metal objects (except brass, etc.) or other magnets without touching them! That’s a superpower enjoyed mainly by individuals that wear tights and flit from building to building. Kids keep quiet about this mysterious power because they don’t yet have a vocabulary for asking questions. Later, a science teacher will tell them about ‘contact’ forces and ‘forces that act at a distance’ but by that time, the mystery of a magnet, met at a young age, has been long forgotten. Even the fact that their Androids and iPhones pluck electromagnetic waves out of thin air and put them in touch with someone ‘at a distance’ isn’t viewed as mystery. It just is. Here’s a simple magnetic device I designed for our grand kids and one that all kids will find easy to put together and fun to use. You don’t need much stuff and everything is sealed in a bottle so there’s no mess to clean up. 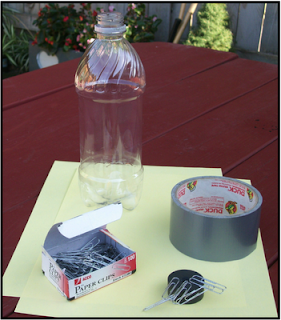 By shaking the bottle, kids can create hanging paper clip structures. 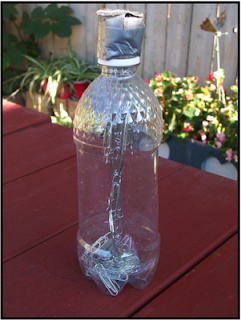 The problem I set the grand kids was to create a chain of paper clips from the top to the bottom of the bottle. It isn't difficult to do and sometimes the chain is thick, sometimes thin. 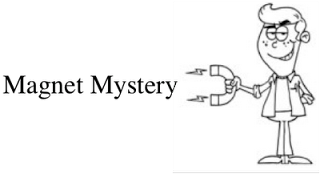 The following picture shows such a chain.